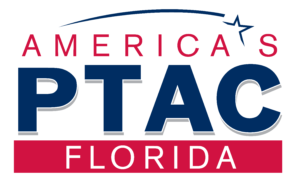 The Government Contracting Services is presented from the Florida Procurement Technical Assistance Center. This service was created in 1985 to assist established Florida businesses with government contracting and procurement support services including assistance with marketing, proposal preparation and contract administration. This service also provides assistance with various small business program applications as well as the Service Disabled Veteran Owned Small Business verification process, and the Federal Woman Owned Small Business program. If you have an established business and want to sell to the government please contact your nearest Government Contracting Specialist for assistance. This Procurement Technical Assistance Center (PTAC) is funded in part through a cooperative agreement with the Defense Logistics Agency.